Your cost basis is determined by the value declared on the estate tax return (if one was filed.) The value declared on the estate tax return will either be the fair market value per share on the date of death, or the market value six months later if the alternate valuation date is elected by the executor. Check with the executor to be sure. Get a copy of the estate tax return or a letter from the executor stating your cost per share so that you will have proof if you are audited by the IRS. For all you first-time executors out there, please be aware that the alternate valuation date election is only available if it results in an actual reduction in the estate tax owed, according to IRC Section 2032(c). So if the total estate falls below the exemption limits, the alternate date valuation election cannot be used. Also, the alternate valuation date can only be selected for the estate as a whole, not on a stock-by-stock basis. Even if an inherited stock's price is higher at the six-month mark, if the executor selects the alternate valuation date, you use the higher value. If no estate tax return was filed, use the fair market value on the date of death of the person from whom you inherited the shares. The fair market value is calculated as the average of the high and low trading prices for the date of death. If the date falls on a weekend, use the average of the Friday and Monday average trading prices. When a stock is no longer actively traded, the online resources mentioned above will no longer have the historical prices available. What should you do? You can try the public library archives of daily newspaper quotes. A large library will often be able to provide historical prices from their archive of stock listings in daily newspapers. In recent years, newspapers have stopped listing the daily activity unless the stock is widely-traded. What is another alternative to find the historical price? Go to the SEC EDGAR filings archive and search for the name of the company. If the stock was listed on a public stock exchange (i.e. not a pink sheet stock) it should have filed annual Form 10-K reports with the SEC. Find the Form 10-K for the year in which the date of death occurred and look under "Item 5. Market Prices for the Registrant's Common Equity." This section will provide the high and low trading prices by quarter. Take the average of the high and low prices in the quarter that the decedent passed away, and use that as a reasonable estimate of your cost basis. However, the SEC online filing archives only go back about twenty years, so if the date of death was more than twenty years ago, this method will not help you. Another alternative is to pay an estate evaluation service such as EVP Systems Inc.
Once you determine the initial cost basis per share of the stock you inherited, you then cycle back to look at corporate actions, reorganizations, and return of capital payments since the date you received the shares. (1) No estate tax will apply in calendar year 2010. (3) The executor is allowed to allocate $1.3 million in basis adjustments (meaning step-up to market value) to the assets in the estate. The executor must file Form 8939 with the IRS to report how the basis is allocated. (4) The executor is also allowed to allocate up to $3 million to increase the basis of assets that are received by the surviving spouse. (5) The rest of the assets will retain a carryover basis. This means you have to figure out the decedent's cost basis--an accounting nightmare. (1) The estate tax rules in effect before 2010 can be used with a new estate tax exemption limit of $5 million per estate and a top estate tax rate of 35%. (2) Assets receive a step-up (or step-down) in cost basis to the market value at either the date of death or the alternate valuation date, depending on which date is selected by the executor. You must consult the executor of the estate to determine which method was elected and how the basis adjustment allowance was apportioned to the assets you inherited from an estate where the decedent passed away in 2010. Because the IRS was so late in issuing the required Form 8939, the filing date has been extended to January 17, 2012. Be sure to obtain a copy of the Form 8939 for your tax records. Click on the pdf icons to see Form 8939 and related IRS instructions. For estates during 2011 and 2012, only Method B can be used, but the exemption limit of $5 million will be indexed for 2012. A new concept is introduced in 2011--portability of the exemption credit between spouses. Married couples will no longer have to create A/B trusts or carefully segregate account ownership in order to achieve full use of the estate tax exemptions available to both of them. However, and this is vitally important to know, the executor MUST file Form 706 on time to make the portability election, even if no estate tax is owed. Furthermore, the filing of Form 706 automatically makes the portability election and steps must be actively taken to avoid making the election if it is not wanted. 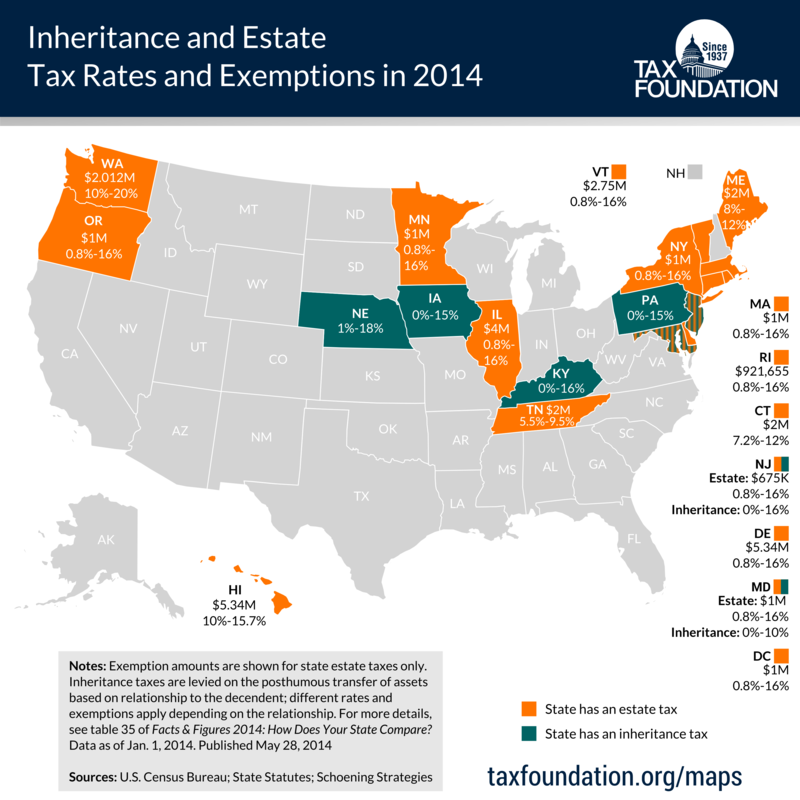 A handy "State Death Tax" chart of the estate and inheritance tax rates imposed by the various states can be found at the McGuireWoods LLP website. The "fiscal cliff" was averted with last minute legislation that maintained the estate tax exemption at $5 million, adjusted for inflation, and revived portability of the exemption between spouses. The step-up to market value rule was retained (a big relief.) The inflation-adjusted exemption amount for 2013 will be $5,250,000. The rate of tax assessed on taxable estates over the exemption amount increased from 35% to 40%. Question: Can the cost basis of inherited securities (stocks and bonds) be adjusted for state and Federal estate taxes paid by the executor or for state inheritance taxes paid by the recipient? Answer: No authority has been found in the Internal Revenue Code that allows adjustments of this type to the cost basis of inherited securities. This is dissimilar to the treatment for gifts, where cost basis adjustment (within limits) is allowed for gift tax paid by the donor. If any readers out there, especially those in states that impose inheritance (as opposed to estate) taxes, have knowledge of cost basis adjustments allowed in their state, please contact us for the information to be added to our website. The inheritance tax owed by the recipient for an asset inherited from a non-family member can be substantial. In Indiana, the tax rate goes up to 20% and only the first $100 is exempt from tax. In Pennsylvania, the inheritance tax for siblings starts at 12% on the first dollar. Ouch! For a list of the states that impose estate or inheritance tax and the rates, click on the map or open the pdf document to the right. The current status of inheritance taxes can be found at the Tax Foundation's State Inheritance Tax page. This tax area is in considerable flux as states look for revenue. A general discussion of state inheritance and gift taxes can be found at Michael Kitces blog. Another good article about state estate and inheritance taxes is the Forbes column by Ashlea Ebeling "Where Not to Die in 2015." If the stock was held in a joint account or joint registration with your spouse, one-half of the stock would get a stepup at the date of death, unless you live in a community property state. If you do live in one of the nine community property states, the entire account gets a stepup to market value at the date of death, not just one-half. The nine states are: Arizona, California, Idaho, Louisiana, Nevada, New Mexico, Texas, Washington and Wisconsin. Community property status is also available as a voluntary election in Alaska. See Community Property for more information. Another special rule is for joint spousal accounts established prior to 1977. Under a 1992 tax case called Gallenstein, the 50/50 rule does not apply. Only the portion of a joint tenancy account contributed by each spouse receives the stepup. Note for estate planning: if the lesser-contributing spouse (usually the wife in a traditional marriage of that era) has a serious illness, it is advisable to retitle the joint assets in any account established prior to 1977 as tenants in common to ensure that one-half of the assets will receive a stepup in basis. The same rules apply for 2010 joint tenancy as in years before in determining how much of the joint tenancy property is includible in the estate. However, see the new rules above for 2010 regarding the $3,000,000 limit on the stepup available for assets left to a surviving spouse if method A is chosen, including through joint tenancy. Your holding period is always long-term for stock that you inherit. Thus, you are eligible for long-term capital gains treatment even if you sell the stock immediately after you receive it. Once you have determined the initial cost basis per share of the stock you inherited, you then must cycle back to look at corporate actions, reorganizations, splits, return of principal payments, etc. since the date you inherited the shares. Please see detailed discussion of Trust Distributions on a separate page of this website. There is a rule (Section 1014 for you Internal Revenue Code readers out there) which prevents you from gifting a low basis asset to your dying mom or dad so that you can inherit it back with a stepup in basis to fair market value at the date of death. If you gift an asset within one year before the date of death and that asset comes back to you or your spouse through inheritance, your basis will revert to what it was before the gift. If you inherited passive foreign investment company stock (PFIC stock) such as ASA Limited, see the special rules on carryover basis when a QEF election is not in place.